As a traditional, accredited University that offers award-winning online education*, we’re uniquely equipped to meet your needs in a flexible format that can fit your lifestyle. We know what military personnel need to be successful while they’re earning their degrees and long after graduation. We’re a proud participant of the Yellow Ribbon Program, and our programs are also listed in the Defense Activity for Non-Traditional Education Support (DANTES) catalog, which means you’ll be able to receive tuition reimbursement support under DANTES for the Army, Marine Corps, Army Reserves, Air Force Reserves and the Air National Guard. Whether you are an active-duty member of the military, a veteran, or a spouse or family member, we can guide you through the admission process, step-by-step. 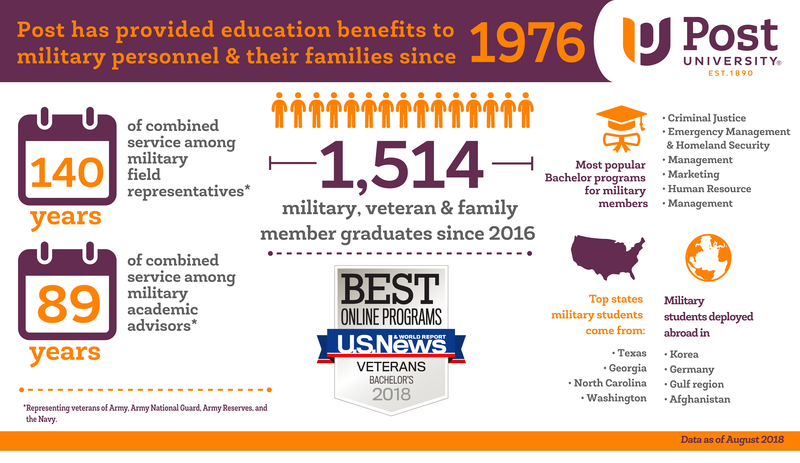 As part of our Military Program at Post University, you will be assigned a specially trained Military Finance Specialist to assist you in using your educational benefits. For Tuition Assistance guidance and Veteran Certifications, please contact MilitaryFinance@post.edu or 800.345.2562. Our professors are experienced industry professionals. Learn in a practice-based curriculum from those who know the work. In addition to all the above benefits, you’ll also have a personal Academic Success Counselor in our Accelerated Degree Program who will assist you every step of the way—from application to graduation. Your counselor will help you find the right balance between work and school, and will make sure you receive all possible credit for your military training and experience. If you’re deployed and you don’t want to take classes during your deployment, we’ll put your records on hold so you won’t have to reapply.